Flanker Eremasi Radrodro scored a match-winning try on debut as Fiji rallied from 15-0 down at halftime to beat Tonga 23-18 Saturday in the opening match of rugby's Pacific Nations Cup. Radrodro took the field in the 12th minute as an injury replacement for Malakai Ravulo and clinched Fiji's come-from-behind win his 74th-minute try. Underdogs Tonga shocked its host by opening a 15-0 lead after 30 minutes, led by scrumhalf Tane Takulu who scored a try among 13 points. Fiji fought its way back into the match with second half tries to Ben Volvola and Neemia Soqeta before Radrodro snatched the game from Tonga's hands with only minutes remaining. 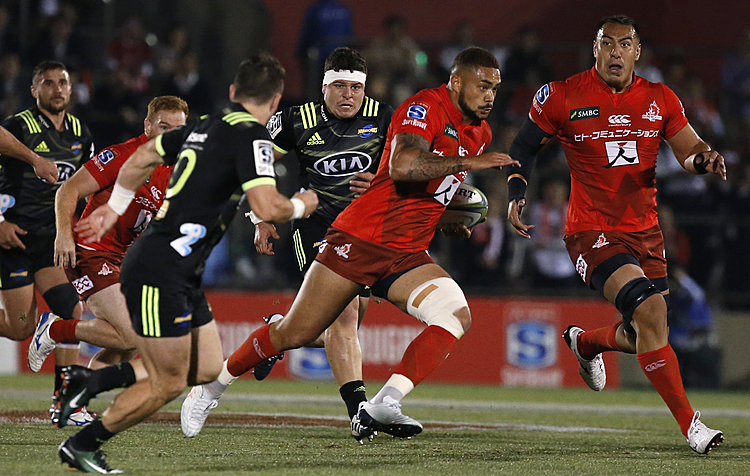 Veteran Seremai Bai added eight points from a conversion and two penalties. Tonga opened the scoring with a penalty to Takalua in the 20th minute then stunned the home crowd with a try seven minutes later to winger Pila Iongi, converted by Takulua. Fiji had barely recovered when Takulua crossed for his own try, sending Tonga to halftime in high spirits with a healthy 15-0 margin. Fiji coach John McKee had named his strongest lineup for the match and as the second half developed, its experience began to tell. Volavola scored the home side's first try in the 45th minute and Bai added the conversion to cut Tonga's lead to 15-7. Soqeta scored in the 50th minute and with the second half still young, Fiji had further slashed the Tongan advantage to 15-12. Takulua did his best for his besieged team, kicking another penalty to make their lead 18-12 with 24 minutes remaining. But Bai chipped away at that 18-12 lead with a penalty, then added another that locked the teams at 18-18 after 71 minutes. With fulltime nearing, Radrodro crashed through the Tonga defense for the decisive try, allowing Fiji fans to breathe a heavy sigh of relief. Fiji meets Samoa in the second match of the tournament in Suva next Saturday. 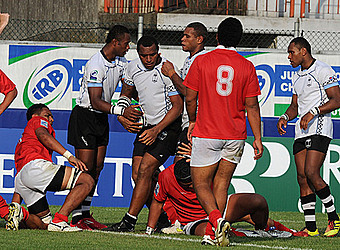 Fiji 23 (Ben Volavola, Neemia Soqeta, Eremasia Radrodro tries; Seremaia Bai conversion, 2 penalties), Tonga 18 (Pila Iongi, Tane Takulua tries; Tane Takulua conversion, 2 penalties), HT: 0-15.